← Ahoy There Me Hearties! ReCOM is a small local charity that believes that computers should be accessible to all. They run computer classes for the over 55’s and also sell low cost refurbished computers to individuals and voluntary groups and other charities. 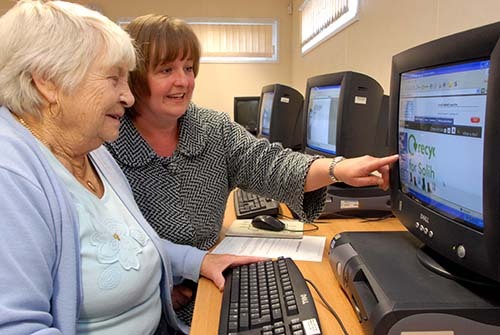 If you are over 55 and want to learn how to use your computer, or would like to improve on your computer skills, in a relaxed and friendly setting then ReCOM’s classes could be for you. ReCOM will be running ‘Silver Surfer’ computer classes for beginners in Acocks Green from January 2012. To register or for more information phone 0121 663 0335 or email admin@recom.org.uk. This entry was posted in adult courses and tagged Acocks Green, adult education, computer courses, IT courses, over 55s, over 60s, Recom, silver surfers, Stone Hall. Bookmark the permalink. Hi my name is Irene Millard i am 67 years old i want to be able to do something like go to a fitness class or take an intrest in something for a couple of days a week in the week or a volentary job , would love to help out in a cafe, can you help ? thankyou . Thank you for your message. There are lots of things going on in Acocks Green once you start asking around. There is a Coffee Morning every Tuesday and Thursday at Acocks Green Library, they may be thankful of help there, and Mondays and Fridays at South Yardley Library, all 10am til noon. There are lots of new courses and taster sessions starting this month at Stone Hall Adult Education Centre, (see the recent post of this site). Most of the churches in the area also organise events and are always looking for volunteers. I have forwarded this to a couple of other members of the Neighourhood Forum for their suggestions, so they may be in touch. You could ask the local cafes if they want some free help in exchange for a free lunch!